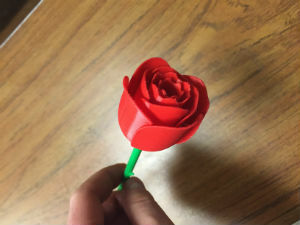 3D printing is the process of taking designs created using computer-aided design (CAD) software and turning them into three-dimensional objects made of plastic. providing another level of service for our patrons to utilize and enjoy. The Fox River Valley Public Library District has a LulzBot Mini 3D Printer. The 3D printer uses PLA (polylactic acid) plastic known as filament to create objects. PLA filament is a bioplastic that is derived from corn and contains no heavy metals, phthalates or BPA. Once a design is sent to the printer, the printer feeds the filament through an extruder with a metal nozzle on the end. The extruder heats up to 215 degrees Celsius (419 degrees Fahrenheit) and extrudes the filament into sheets, layer-by-layer, on what is known as the build plate or build platform. As these sheets cool, almost instantaneously, they bind together to create an object. Objects created with the 3D printer can range from completely hollow to completely solid as determined by the quality settings input into the printer. Higher quality prints use much more filament than lower quality prints. It is important to note that the purpose of our 3D printer is to promote and foster creativity and knowledge, therefore we cannot guarantee that objects printed will be of commercial quality. If patrons need something to be extremely precise, they may consider using a commercial printer. Maximum print dimensions: 6.2 in. long x 6 in. wide x 6 in. tall. Print time: On average, a print takes about 1—3 hours; however, something that is maximum print size will take over 20 hours to print. The bigger the object, the longer it takes to print. Contact Corner 68 for more information.